Physicists at MIPT and their British and Russian colleagues revealed the mechanisms leading to photocurrent in graphene under terahertz radiation. The paper published in Applied Physics Letters ends a long-lasting debate about the origins of direct current in graphene illuminated by high-frequency radiation, and also sets the stage for the development of high-sensitivity terahertz detectors. Such detectors have applications in medical diagnostics, wireless communications and security systems. In 2005, MIPT alumni Andre Geim and Konstantin Novoselov experimentally studied the behavior of electrons in graphene, a flat honeycomb lattice of carbon atoms. They found that electrons in graphene respond to electromagnetic radiation with an energy of quantum, whereas the common semiconductors have an energy threshold below which the material does not respond to light at all. However, the direction of electron motion in graphene exposed to radiation has long remained a point of controversy, as there is a plenty of factors pulling it in different directions. The controversy was especially stark in the case of the photocurrent caused by terahertz radiation. Terahertz radiation has a unique set of properties. For example, it easily passes through many dielectrics without ionizing them—this is of particular value to medical diagnostic or security systems. A terahertz camera can detect weapons concealed under a person's clothes, and a medical scanner can reveal skin diseases at early stages by detecting the spectral lines ("fingerprints") of characteristic biomolecules in the terahertz range. Finally, raising the carrier frequency of Wi-Fi devices from several to hundreds of gigahertz (into the sub-terahertz range) will proportionally increase the bandwidth. But all these applications need a sensitive, low-noise terahertz detector that is easily manufactured. A terahertz detector designed by researchers at MIPT, MSPU and the University of Manchester is a graphene sheet (colored green in figures one and two) sandwiched between dielectric layers of boron nitride and electrically coupled to a terahertz antenna—a metal spiral about a millimeter in size. As radiation impinges on the antenna, it rocks electrons on one side of the graphene sheet, while the resulting direct current is measured on the other side. It is the "packing" of graphene into boron nitride that enables record-high electric characteristics, giving the detector a sensitivity that is a cut above the earlier designs. However, the main result of the research is not a better-performing instrument; it is the insight into the physical phenomena responsible for the photocurrent. 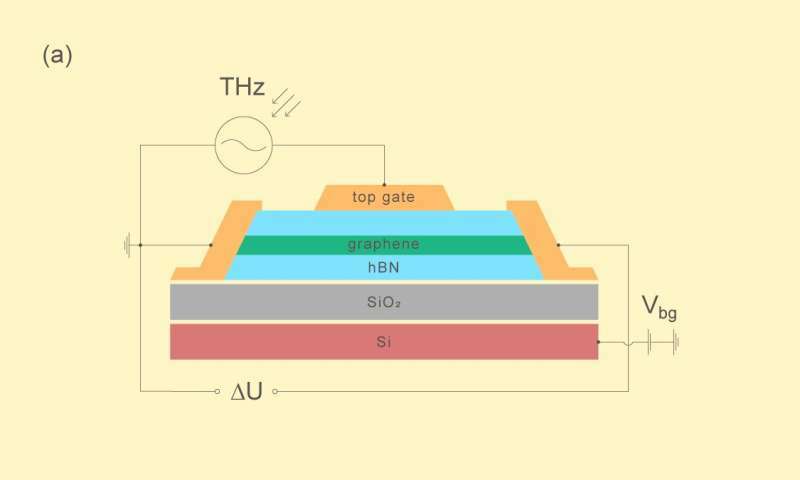 There are three main effects leading to electric current flow in graphene exposed to terahertz radiation. The first one, the photothermoelectric effect, is due to the temperature difference between the antenna terminal and the sensing terminal. This sends electrons from the hot terminal to the cold one, like air rising up from a warm radiator up to cold ceiling. The second effect is the rectification of current at the terminals. It turns out that the edges of graphene let through only the high-frequency signal of a certain polarity. The third and most interesting effect is called plasma wave rectification. We can think of the antenna terminal as stirring up "waves in the electronic sea" of the graphene strip, while the sensing terminal registers the average current associated with these waves. 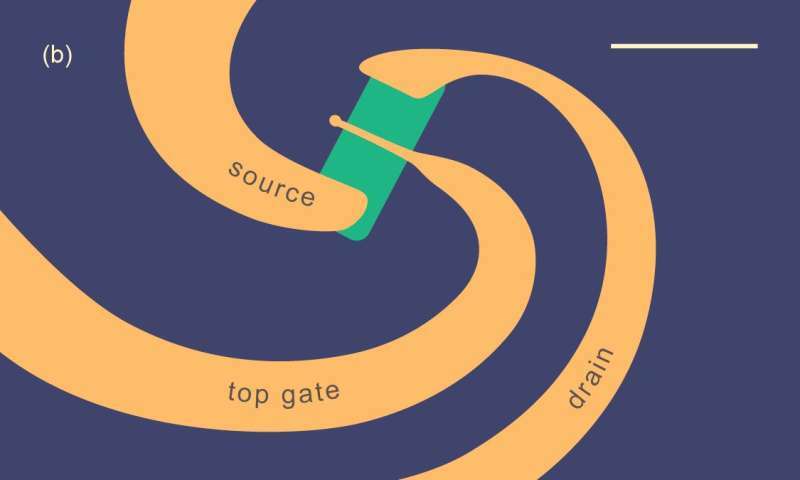 "Earlier attempts to explain the photocurrent in such detectors used only one of these mechanisms and excluded all the others," says Dmitry Svintsov of MIPT. "In reality, all three of them are at play, and our study found which effect dominates at which conditions. Thermoelectric effects dominate at low temperatures, while plasmonic rectification prevails at high temperatures and in longer-channel instruments. And the main thing is that we figured out how to make a detector in which the different photoresponse mechanisms will not cancel each other, but rather reinforce each other." These experiments will contribute to the best design for terahertz detectors and the development of remote detection devices for dangerous substances, safe medical diagnostics, and high-speed wireless communications.